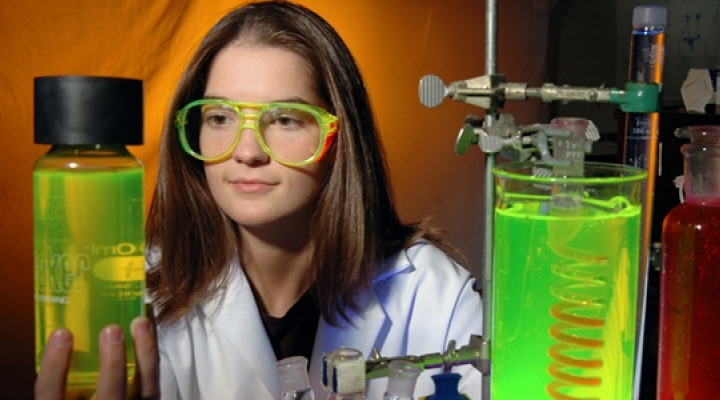 The College of Science has a number of scholarships and chemistry majors are encouraged to apply. Awardees are selected by The Chemistry Awards Committee. The Top Senior Student in Chemistry will be awarded $100 in cash and a name plaque to be placed in a wall case on the third floor of the Moore Building. The awardee must be a graduating major in the Department of Chemistry. The student will be judged by performance in Chemistry courses at EKU as well as overall excellence in all other courses. The amount of $100 to be deducted from the student’s registration fees for the next fall semester. The awardee must be a student who has earned between 60 and 89 credit hours at the time of the selection. The student will be judged by performance in Chemistry courses at EKU as well as overall excellence in all other courses. The amount of $100 to be deducted from the students registration fees for the next fall semester. The awardee must be a student who has earned between 30 and 59 credit hours at the time of the selection. The student will be judged by performance in chemistry courses at EKU as well as overall excellence in all other courses. Will be awarded a Handbook of Chemistry and Physics donated by the Chemical Rubber Company. The awardee must be a student who has completed less than 30 credit hours of classes at the time of the selection. The student will be judged by performance in the first attempt in CHE 111/112. A Merck Index donated by David Igo, a graduate from the EKU Chemistry Department, will be awarded to a graduating student with a Chemistry major who has shown potential in Chemistry (not necessarily the student with the highest GPA). This award was established in memory of Dr. Harry M. Smiley and honors our top returning graduate student each year. The recipient of this award shows excellence in teaching and service to the department, and has embarked on an active research program. Also, the recipient must be resident of Kentucky. This scholarship is endowed from a bequest by Dr. Thomas C. Herndon, former Chemistry professor and chair of the Chemistry Department. The award (amount to be determined when interest is known) will be deducted from the student’s registration fees for the next fall semester. The awardee must be a major in the Department of Chemistry with a minimum 3. 0 GPA. Only those who apply for the award can receive it. Awardees are selected by the Advisors and Director of the Forensic Science Program. Awarded to a graduating senior who has shown outstanding academic achievement and potential for a productive career in Forensic Science. This award carries an honorarium of $100. Awarded to a junior in the Forensic Science Program who has excelled in the classroom. This award carries an honorarium of $100.